#1. This week's number one is former international guard Emmanuel Mudiay (196-96, currently plays in NBA). He could not help the New York Knicks (10-35) in their last game. Despite Mudiay's very good performance the New York Knicks (10-35) were edged 101-100 on the road by the Washington Wizards. He was the top scorer with 25 points. Mudiay also added 7 rebounds in 31 minutes on the court. It was New York Knicks' sixth consecutive loss in a row. It's Mudiay's first season with the team. He has individually a very good year with high stats. Mudiay averages: 14.8ppg, 3.1rpg, 4.0apg, 2FGP: 50.3%, 3FGP: 31.7% and FT: 75.2% in 37 games he played so far. He played for the DR Congolese senior national team two years ago. #2. Second place goes to an international small forward Christian Eyenga (201-89, currently plays in Basketball Champions League). Eyenga was not able to help Baloncesto Fuenlabrada in their game against Hapoel Jerusalem (9-2) in the Basketball Champions League. He scored 5 points in 17 minutes. The seventh-placed Baloncesto Fuenlabrada (4-7) lost 77-91 in Jerusalem to the second-ranked Hapoel in the group C of Basketball Champions League. It was Baloncesto Fuenlabrada's seventh consecutive loss in a row. There are only three games left until the end of the Basketball Champions League Regular Season. So now every game will be critical. This year Eyenga's overall stats are: 7.5ppg, 3.2rpg, 1.5apg, 1.3bpg, 2FGP: 47.1%, 3FGP: 25.9% and FT: 66.7% in 11 games. He is in the roster of the DR Congolese senior national team. #3. The DR Congolese player who performed third best last week abroad was an international forward Omari Gudul (206-94, agency: Two Points, college: Angelo St., currently plays in France). He led ADA Blois to a victory over the 12th-ranked Poitiers (6-9) 71-63 in the French ProB (second division) in Tuesday night's game. Gudul was MVP of the game. He scored 14 points and grabbed 6 rebounds in 24 minutes; quite an impressive performance considering it's only Gudul's third season in pro basketball. ADA Blois Basket 41 (7-7) is placed eighth in the ProB. Gudul has relatively good stats this year: 13.7ppg, 6.9rpg, 2FGP: 59.6%(81-136) and FT: 75.0% in 14 games. He is also a member of the DR Congolese senior national team. #4. Forward Jonathan Kasibabu (203-96, currently plays college basketball in the States), who plays in the NCAA was not able to secure a victory for the Fairfield (2-5) in their last game on Saturday. Despite Kasibabu's very good performance his team was defeated 73-68 in Buffalo by the Canisius College. He recorded a double-double by scoring 16 points and getting 13 rebounds. Kasibabu is one of the most experienced players in a team as it's his fourth year in Fairfield's roster. This season Kasibabu has relatively solid stats: 11.5ppg, 7.9rpg and 1.5apg. He is also DR Congolese national team player. #5. International guard Mathieu Kamba (196-95, agency: Dynamics Global Management, college: Cent.Arkansas, currently plays in Spain) contributed to Araberri's surprising victory against the eighth-ranked Melilla Baloncesto (10-8) 82-77 in the Spanish LEB Gold (second division) last Friday. Kamba scored 9 points and added 4 passes. Saenz Horeca Araberri (6-12) is placed 14th in the LEB Gold. They ended the series of four consecutive loses. Kamba has reliable stats this season: 13.4ppg, 3.8rpg, 1.8apg and 1.9spg. He has a dual citizenship: Canadian and DR Congolese. Kamba plays currently for the DR Congolese national team. #6. Power forward Jonathan Malu (200-93, currently plays in Germany) couldn't help Artland Dragons (9-10) in their game against Gladiators (10-9) in the German ProA (second division). He recorded 8 points in only 8 minutes. Artland Dragons lost 78-91 in Trier to the higher-ranked (#6) Gladiators. This year Malu's total stats are: 4.6ppg and 2.1rpg in 15 games. Despite he played previously for the German U20 national team, Malu is also an international player who is currently on the senior DR Congolese National Team roster. #7. International center Gullit Mukendi (203-96, currently plays in Spain) couldn't help Azuqueca (9-9) in their game against Real Murcia (13-5) in the Spanish LEB Silver (third division). He scored 8 points and blocked 2 shots. Azuqueca (#6) was crushed 76-55 in Murcia by the second-ranked Real in the East group. There are only four games left until the end of the Regular Season. So now every game is very crucial. Mukendi has averaged so far 4.3ppg and 2.3rpg. He is also DR Congolese national team player. #8. Swingman Shekinah Munanga (201-97, currently plays in France) couldn't help Etoile Angers (7-3) in their game against Lorient (11-8) in the French NM1 (third division). Munanga recorded 6 points and grabbed 4 rebounds in only 14 minutes. 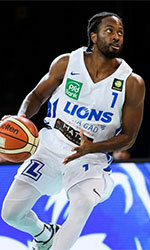 Etoile Angers (#4) was crushed 90-62 on the opponent's court by the lower-ranked (#4) Lorient in the Group B. Munanga has averaged so far 4.9ppg and 4.2rpg in 17 games. He plays currently for the DR Congolese national team. #9. International point guard Carl Ona-Embo (185-89, currently plays in Germany) couldn't help Lions (10-9) in their game against Ehingen/Urspringschule (11-8) in the German ProA (second division). He cannot count Sunday's game as one of the best ones. Ona-Embo recorded only one point and added 4 assists. Lions was crushed 93-72 in Allmendingen by the higher-ranked Ehingen/Urspringschule (#5). It was Lions' first loss after seven consecutive victories. Ona-Embo has averaged so far 8.6ppg, 1.3rpg and 2.0apg. Worth to mention Ona-Embo played also at Eurobasket Summer League, which helped him get the job in pro basketball. He is also in the roster of the DR Congolese national team. #1. Bismack Biyombo (206-C-92, currently plays in NBA) led Charlotte Hornets to an easy victory against the Phoenix Suns (11-37) crushing them 135-115 in the NBA last Saturday. Biyombo recorded a double-double by scoring 11 points and getting 13 rebounds. He also added 3 assists and 5 blocks. The Charlotte Hornets have 22-24 record this season. It was his team's third consecutive victory in a row. Biyombo's overall stats this season are: 4.6ppg, 5.0rpg and 1.2bpg. #2. Experienced Charles Kahudi (199-SF-86, currently plays in EuroCup) contributed to an ASVEL Lyon-Villeurbanne Basket's victory against the fourth-ranked Deutsche Bank Skyliners (0-3) 70-58 in the Eurocup on Wednesday night. He scored 6 points in 23 minutes. ASVEL Lyon-Villeurbanne Basket (3-0) is placed first in group F. So far his team won all three games in the Top 16. There are only three games left until the end of the Eurocup Top 16. So now every game will be critical. Kahudi is one of the most experienced players in a team as it's his fourth year in ASVEL Lyon-Villeurbanne Basket's roster. Kahudi has relatively good stats this season: 10.9ppg and 4.2rpg in 10 games he played so far. He has a dual citizenship: DR Congolese and French. #3. Kevin Tumba (206-C/F-91, currently plays in Basketball Champions League) contributed to an UCAM Murcia's victory against the closely-ranked Sidigas AV (7-4) 63-57 in the Basketball Champions League in Wednesday night's game. Tumba scored 6 points. It was the game of the round between two top 2 ranked teams in group A. Universidad Catolica de Murcia CB (10-1) is placed first. It was his team's third consecutive victory in a row. There are only three games left until the end of the Basketball Champions League Regular Season. So now every game is very crucial. Tumba's overall stats this season are: 3.9ppg and 3.8rpg. He is another player who holds two passports: DR Congolese and Belgian. #4. Joel Ntambwe (206-F-98, currently plays college basketball in the States), who plays in the NCAA could not help the UNLV (4-1) in their last game on Wednesday. Despite Ntambwe's very good performance his team were badly defeated 106-88 at home by the U.S. Air Force Academy. He scored 18 points and grabbed 7 rebounds. Ntambwe has relatively good stats this season: 12.9ppg and 5.9rpg. #5. Guy Muya (193-PG-83, currently plays in Belgium) managed to help Basic-Fit Brussels in a victory against the closely-ranked Liege Basket (9-5) 79-71 in the Belgian Euromillions League on Sunday night. Muya scored 5 points in 9 minutes. Basic-Fit Brussels (9-3) is placed second in the Euromillions League. It was his team's sixth consecutive victory in a row. Muya has been at the team for four years. This season his total stats are: 4.2ppg and 2.2rpg in 11 games. Muya has both DR Congolese and Belgian nationalities. #6. Cedric Kuakumensah (204-F-93, college: Brown, currently plays in France) contributed to an easy victory against the 14th-ranked GET Vosges 86-70 in the French NM1 (third division) in Friday night's game. He recorded 7 points. Kuakumensah has reliable stats this season: 10.3ppg, 7.0rpg and 1.7apg. He is a naturalized American. Strangely Kuakumensah has never played in DR Congo. #7. Wen Boss Mukubu (198-F-83, college: UAB, currently plays in Belgium) contributed to a 3-point Limburg United's victory against the closely-ranked Belfius Mons-Hainaut 85-82 in the Belgian Euromillions League last Sunday. He scored 7 points in only 14 minutes. This year Mukubu's total stats are: 6.3ppg, 3.6rpg and 1.6apg in seven games. He also holds two passports: DR Congolese and Belgian. #8. Eric Katenda (206-F-92, college: N.Texas, currently plays in Sweden) was not able to help Uppsala Basket (1-22) in their last game on Wednesday. Despite Katenda's very good performance the bottom-ranked Uppsala Basket was defeated 89-74 on the road by the leading Sodertalje Kings. He was the second best scorer with 17 points. Katenda has reliable stats this season: 11.8ppg, 5.3rpg and 1.1apg. He has DR Congolese and French nationalities. #9. Nicola Akele (203-F-95, college: Rhode Island, currently plays in Italy) was not able to secure a victory for Roseto Sharks (6-11) in their last game. Despite Akele's good performance Roseto Sharks (#13) lost 77-87 in Cagliari to the lower-ranked (#16) Cagliari DA in the East group. He scored 10 points and grabbed 8 rebounds in 32 minutes. Akele has reliable stats this year: 13.2ppg, 6.8rpg, 1.2apg and 1.3spg in 17 games. He has dual citizenship: DR Congolese and Italian. Despite Akele's DR Congolese passport, he previously played for the Italian U20 national team and is probably not eligible to play for the DR Congolese team. #10. Florent Thamba (208-F-99, currently studies in the States) contributed to Baylor's victory against the West Virginia University 85-73 in the NCAA in Monday night's game. He recorded 5 points and grabbed 6 rebounds. Thamba has averaged so far 2.0ppg and 2.0rpg.